← It’s Friday! Time for the Book Blogger Hop! Recommended? Yes, to all fans of mystery and romance both. Review: “It has been said, by myself and others, that a love-interest is only an intrusion upon a detective story,” Sayers says in the dedication. “But to the characters involved, the detective-interest might well seem an irritating intrusion upon their love-story.” And that is exactly what happens here. Lord Peter and the new Lady Peter, previously Miss Harriet Vane, have gone off to the country on their honeymoon. Peter has purchased an old Tudor manor-house for Harriet as a wedding present, and they move in in the middle of the night, having narrowly escaped floods of newspaper reporters. The house has not been aired, food has not been brought in, the chimneys have not been swept, but they topple into bed to deal with it in the morning. And in the morning, they discover a body in the basement – but not before having the housekeeper and the chimneysweep in, neatly destroying most of the potential clues. This is very much a book about a romance. Just because the characters are already together doesn’t mean there’s no tension — the tension they’re dealing with is how to remain true to themselves while being married and madly in love, rather than the will they/won’t they tension of most romance stories. Of course they will; they are. (There’s a hilarious scene of double entendre toward the beginning with one of the new neighbors.) The question is, though, once you’ve fallen madly in love with someone, do you continue to treat them like a person or do you start to treat them like a fragile and precious object? And what happens to you if you do? My favorite part about this book, though, was the ending. Once the murderer has been caught, there’s still the trial and execution to deal with. We’ve seen in earlier books that Peter doesn’t deal with that part well; he likes the investigation but he hates the fact that he, personally, is responsible for people being hanged. This is just the first time that we see his reactions in detail, and it’s heartbreaking and wonderful. Wonderful, of course, because now he has Harriet for support. I know there are more books in this series, finished from Sayers’ notes by Jill Paton Walsh, but this was such a perfect end to the series I don’t know that I’ll read them. I'm a recent library school graduate in Madison, Wisconsin, looking for a full-time professional job and trying to manage a fulfilling life in the meantime. Oh, and I read. A lot. 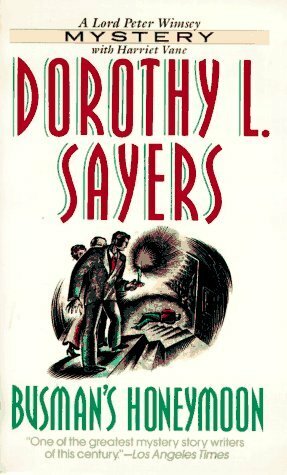 Posted on June 4, 2011, in New To Me and tagged book review, dorothy l. sayers, mystery, romance. Bookmark the permalink. 5 Comments. Don’t read Thrones, Dominations (Jill Paton Walsh can’t write well enough to hide the mystery, much less to be Sayers), but do find the Talboys fragment (just the fragment) because it’s interesting. I have a short story collection with it in. I don’t know if it’s out there in other forms. Good to know. I’ve been thinking about hunting down some short story collections — I’ll add them to the infinite list of library holds. I’ve heard of Sayers before, but I can’t say I’ve picked up any of her books. Maybe I’ll start with this one.